75502PB is rated 3.6 out of 5 by 8. Experience a better shower with the control and flexibility of a Delta® hand shower. Great for showering yourself or your loved ones and pets, as well as for keeping your shower and tub clean. Designed to look like new for life, Brilliance® finishes are developed using a proprietary process that creates a durable, long-lasting finish that is guaranteed not to corrode, tarnish or discolor. While other products may gather unsightly mineral build-up over time, Delta soft rubber Touch-Clean® spray holes allow any mineral residue to simply be wiped away for an instantly refreshed look – with no need for soaking or the aid of chemical cleaners. Rated 5 out of 5 by Slice from Easy to install, great spray settings ,wall & hand Very happy with price anyone should check because operation is fantastic & you know it is mfg. by Delta who is top of the line. Rated 2 out of 5 by jliver from not durable shower head holder broke within 10 months of purchase. Other wise worked well, now useless as a shower head. Rated 4 out of 5 by Sailmm5 from Works great. Hand shower is well built and works quite nicely. The hose however is extremely stiff and does not hang vertically but bows out from the shower wall. It is quite rigid. A more flexible hose would make this an outstanding purchase. Rated 3 out of 5 by Kiwi from good value but has drawbacks I bought this to replace my old similar showerhead. Works fine, but hose is stiff and never conformed to hanging straight down and is hard to remove from holder when using as hand held. Otherwise it has a good spray and selections. Rated 5 out of 5 by Tunaal from Great product for the right price I received this hand shower promptly for a good value. It installed in minutes and works great. Rated 4 out of 5 by Danny from It looks and works good except stiff hose. For the price, I am happy. Rated 1 out of 5 by agapetile from Review of all in one shower Nice look but not made well. When you detach the shower head, it is VERY dificult to take it out of the holder! Is the hose removable from the shower head on the 75502PB model product? The distance from pipe center (threaded end where shower head would attach) to shower stall ceiling is 5 3/4&quot;. Is this sufficient space for installation of 75502PB shower head? Thank you for your question. Delta Faucet model 75502PB has a 1/2-14 connection. The wand does screw onto the hose. Does this shower head spray pulsate? The shower head broke off on this Delta Model 75502PB. I need to replace the shower head.It is polished brass. Please advise. 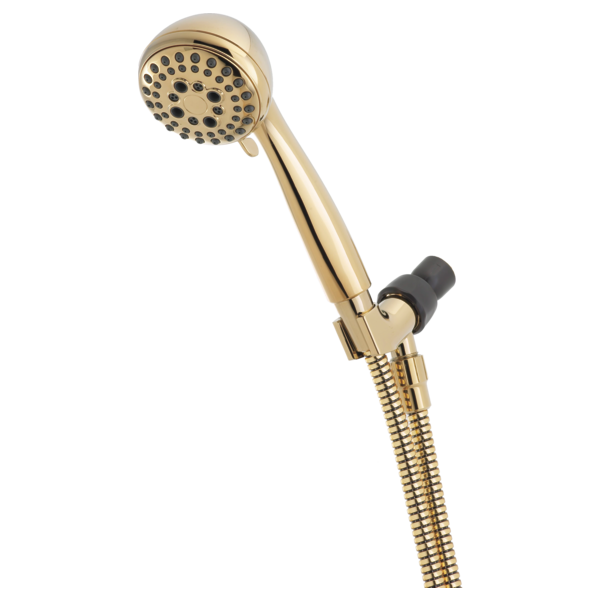 I would like to keep the solid brass Delta shower head now connected to the wall arm and add a hand shower. 1) Is Brilliance Brass the same color as tradtional polished brass? 2) Is the hose in this hand-held shower brass or plastic-covered (which I would not want). 3) I see the fitting is black/looks plastic. I would like to keep all my shower components brass. Would I need any other parts to do that? If so, what should I purchase? Thanks. Thank you for your question. Delta Faucet model # 75502PB is the same color as our traditional brass faucets. It is manufactured of a non-metallic material. We do not make them of an all brass material because it would be too heavy. How does this hang on the wall ? My hose connects up to the main shower head. It's not clear how this hooks on the wall. What is that little chrome/black strut that comes in from off-camera at the right ? Thank you for your question. Delta Faucet model # 75502PB is attached to your existing shower arm. The hook is on the end of the shower arm and that is where the hand shower hangs. It does not hang on the wall at all.